1. Our Alpine Pearls are easily accessible via train and long-distance bus connections. 2. Getting from the train station or bus stop to the hotel? – No worries! Pick-up services take care of that. 3. Guaranteed mobility around town: top-notch mobility services take you to all the destinations your heart desires. 4. For your trip home: keep that relaxation momentum going, while we take you from hotel to train station/bus stop. 5. Trip planning made easy: efficient and quick consultation, brief booking process! Our Alpine Pearls are easily accessible via train and long-distance bus connections. 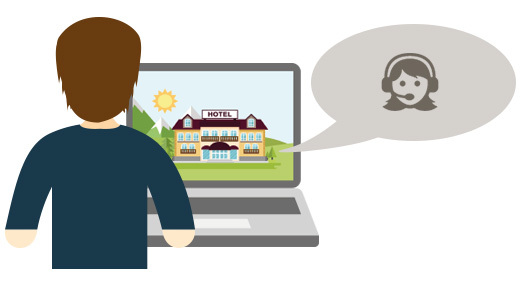 Hotels and tourism agencies support your planning of a climate-friendly holiday with the most up-to-date information on direct connections. Please contact us! We arrange your transfer from the train station/bus stop directly to your hotel. Many of our villages offer a free pick-up service to and from the hotel. Our Alpine Pearl-affiliated host welcomes you to your special Pearl. Enjoy excellent mobility around town – guaranteed! Whatever your heart desires – be it restaurants, lodgings, cable cars, lifts, shopping areas, Alpine huts, village shops, museums or tourist attractions – you’ll get there in a jiffy. Rental stations for e-bikes, bicycles, Segways and cars make sure you’re mobile and trailheads for hikes or cross-country tracks through stunning scenery are just around the corner. Take advantage of the valuable, all-inclusive mobility cards and our personal mobility consultant. A relaxing trip home – guaranteed softly mobile and climate friendly! To make sure that relaxed feeling doesn’t wear off too quickly, we arrange your transfer from hotel to train station or bus stop. Many of our villages offer a free transfer service from the hotel. Let someone else do the driving! Sit back and relax on train or bus while daydreaming about your wonderful time at the Alpine Pearl. We're looking forward to your next visit to one of our Alpine Pearls and our Alpine Pearl-affiliated hosts! Already daydreaming about your next holiday – gentle to the environment, without your car, yet completely mobile? Continue here to plan your trip. Get quick and handy information. 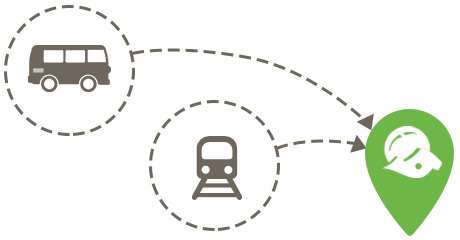 All our Alpine Pearls villages have excellent international railway connections and are easily accessible by train from all over Europe. Comfortably and relaxed into your holidays – directly from your closest train station! Thanks to the new, comfortable long-distance bus services, travelling from many European cities to the Alps has become convenient and affordable. Transfer services from the bus terminal of your trip to your lodging are optimal and ensure an enjoyable journey from start to finish. Your Alpine Pearl-affiliated host is looking forward to your visit at the Pearl of your choice! We only recommend plane travel if you are coming from far away. The tourism agency is happy to plan your continued trip to the hotel, for example, an airport transfer service. If you do feel bad about your carbon footprint, there are ways to soothe your conscience: Visit www.atmosfair.de or similar websites to offset your CO2 emissions by supporting climate protection projects. If you prefer to take your car to your holiday destination, our villages will help you unwind and give your car a rest: Just leave your car key at the hotel and enjoy the numerous mobility offers our Pearls have in store. They are experts when it comes to moving around without a car. Try it! You’ll like it. Car-free holidays are a blast! Many of our Pearls have charging stations for e-cars.